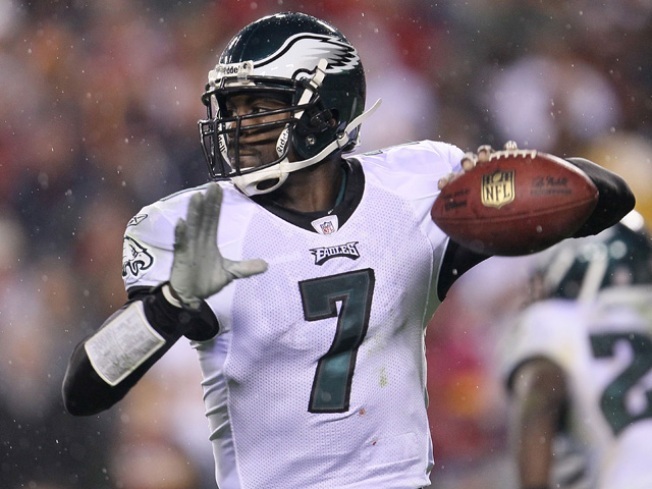 Vick put up a nearly flawless 150.7 passer rating while passing for 333 yards and four TDS on 20-for-28 passing. "There is a big message in what Michael is doing," (NFL commish Roger) Goodell told the Daily News Thursday morning, "He's a superstar athlete who everyone thought had everything in the world. He fell from grace tragically by making some horrific mistakes, paid a significant price, worked his way back in and now he's being successful. … I'm proud of how he has responded. There are so many examples in our society of failure, people falling short. We need more success stories. I'm hoping Michael Vick will be a success story. People need to see that. People need to be inspired by that - a person made a tragic error and he's overcome it." I have little doubt that Goodell is sincere in his praise of Vick. I’m sure he really is proud of the reformed dog killer. But you can also present the cynic’s case here. It makes perfect sense for Goodell to talk up Vick as a way of distancing the QB from his dog killing past, a past many people are unwilling to ever forget. By heaping praise upon Vick and telling the public, “See! He’s better now!” Goodell helps make the league look good for salvaging the quarterback off the scrap heap. What’s more, it gets people away from castigating the NFL for welcoming Vick back to begin with. Ten years ago, Ravens linebacker Ray Lewis won a Super Bowl on the heels of being found guilty for obstructing justice in the case of two men being stabbed to death. After winning that Super Bowl, Lewis slowly was able to work his way back into the NFL PR mainstream. It seemed ludicrous that Lewis would ever again thrive as a commercial spokesperson after the stabbing incident. But he has. He’s doing ads and riding flying ravens while covered in Old Spice suds. He’s been completely rebranded. And you can feel that beginning to happen with Vick. You can see forces like Goodell lining up behind him and slowly refurbishing his image. Five years from now, Vick could very well be back endorsing commercial products, which sounds insane. But trust me, if the NFL feels like its in their best interests to get Vick back selling shoes, they will. Vick has always been held up as an exception to the rule of athlete redemption stories. Sure, Lewis and Kobe Bryant can get their pristine images back. But Mike Vick? After torturing and killing scores of animals? You think it’s impossible, but I promise you, you’re underestimating the branding forces of Roger Goodell and company.